Population and House Supply: A few things are factual and measureable. Firstly, the UK is not building enough properties to meet demand. Secondly the population is increasing dramatically and this shows no signs of slowing. Building: Firstly most knowledgeable property people think the country should be building at least 350,000 homes a year just to keep up with demand, never mind exceed it. In reality building levels have slumped over the years to around 100,000 in 2010 before increasing slightly to around 150,000 in 2014 before dropping back in the last 8 months. Population: Meanwhile the population increases by 450,000 a year. Assuming two people to every property built, that a requirement of 225,000 homes a year just to stand still. But we have a deficit of about 100,000 to 150,000 homes a year for the last 15 years to catch up on in the country as a whole. Location: Of course some areas like West Wales have plenty of properties since th e economy is lacklustre and population is stable. But in London it’s a different world and as we have been warning for the last ten years – there is an ongoing housing crisis that is getting worse by the month and will continue to get worse because not enough homes are being built. This is a key reason why house prices in London continue to rise and rental prices continue to rise. In Manchester the population is also growing but if you go to Middlesbrough/Teeside – you wont see much evidence of a population boom, and there are plenty of empty terrace houses. Housing Crisis Gets Political: Interestingly the housing crisis has started to attract political capital recently with firstly the Tory Coalition starting the Help to Buy Scheme then on 13 March 2015 the Liberal-Democrats announced their own policy of allowing anyone renting a housing association or council house for 30 years acquiring automatic ownership after this time. Tories and Lib-Dems Home Ownership Thrust: Because both the Tories and the Lib-Dems seem to want to capture the aspirations of a property owning British public, this is likely to boost house prices further later in 2015 and 2016 if the Tories win at least a Coalition in May 2015. In the last few weeks – the Tories have been creeping ahead as Ed Miliband and Ed Balls continue to shoot themselves in the foot with gaffs, inconsistencies and hypocritical actions. Outcome in May: Simple put, if labour get into power, property prices will slide as the economy crashes – and confidence drops dramatically. But of the Tories win power again, property prices will soar very quickly as everyone jumps in for another five years of property price increases. Both seasoned buy-to-let investors, international investors, the average UK citizen and first time buyers have all been holding off in the last six months – particularly in London and the SE England. Everyone is at the ready immediately after the Election result is announced to jump in if the reason goes the Tory’s way. Europe and Fiat Currency: In Europe, 8 years of economic stagnation and subdued or crashing house prices has finally led the European Central Bank to announce another gig antic bond purchase programme. This has had the desired effect of decreasing the Euro value, and therefore it should increase prices and inflation as imports from outside Europe become more expensive. Eventually – say in 6-12 months time, this gigantic wall of Euros – of free currency for the super-rich elite - should start to feed through into European property prices. 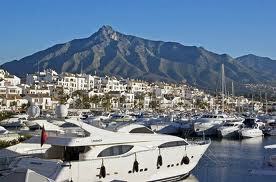 The mainland Europe rich will start to buy prime Paris and prime south Spanish property – in places like Marbella and select parts of Barcelona. Property prices in Frankfurt could start to rise along with Munich, Luxembourg, Monaco, Geneva and Strasburg and Copenhagen. The most desirable places that the the playgrounds of the rich. Rich get Richer: Yes, the printed currency will start to create asset bubbles again, and create an illusion of growth, but the poor will get poorer because food and energy prices will rise again, whilst the rich will get richer as property prices, art prices and wine prices rise. US Reversal: We might then see the dollar value rise so sharply that the US economy starts to slow – then of course they will start to print more dollar currency and another wall of currency will hit global markets and drive high end real estate prices up even further. Inflation All The Way: We hope you get the picture that despite all the talk of deflation, prime real estate prices will continue to rise sharply over the long term as more fiat currency is printed. Eventually gold and silver prices will rise as people realise how worthless the currencies actually are. For the time being, it looks like $1200/ounce gold and $16/ounce silver, but long term, we are pretty convinced people will look back and thing – particularly silver – was the bargain of the century at $16/ounce. Oil Price Boost: When commodities prices crash, as the oil price has recently – the converse is true. Inflation drops, growth booms, property prices rise sharply and unemployment drops. When oil is plentiful it has a huge positive impact on the western European economies along with the USA. 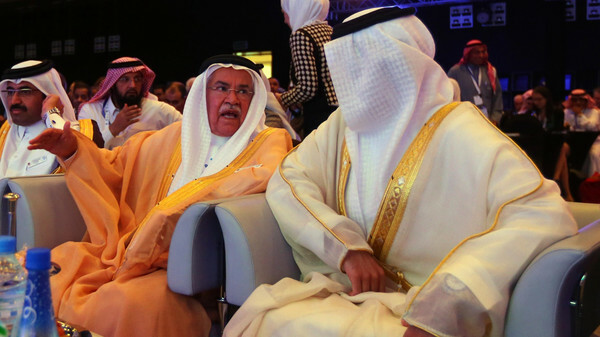 This is what we are seeing start now – since the oil price crashed to $50-$60 in December 2014. It normally takes 6 months to feed through – by May 2015 – the Tories will certain catch this economic boom wave that might be just enough to get them into power again. It’s a perfect timing for the election as the economy improves sharply and food-fuel prices drop, whilst property prices would normally be given a big boost – if it were not for the uncertainty in the election result. Super Cycle: But what we cannot predict is whether low oil prices are here to stay – and it’s the end of the commodities super cycle that started around 2000. We rather think there could be one last drive up in oil, gold and silver prices through to 2018 before a big crash and the next cycle starting, but we might be wrong. Its difficult to say. Normally these super-cycles take around 18 years – so if this cycle ended in 2014 it would be about the shortest seen in the last 120 years. 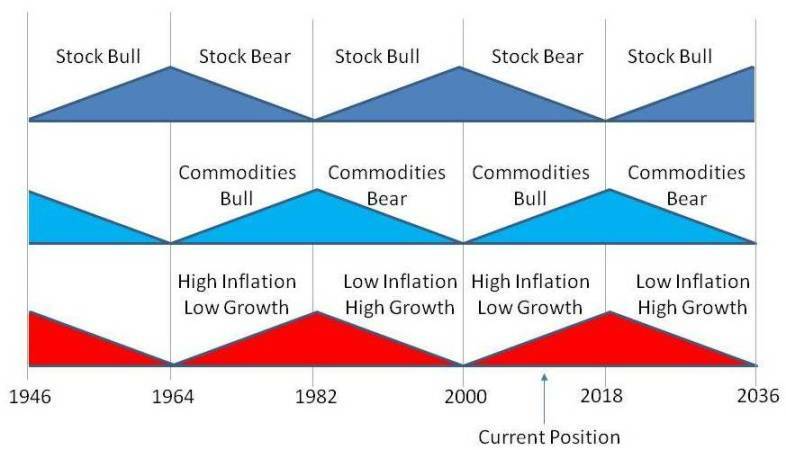 The above model was prepared by PropertyInvesting.net in 2013 - we may be at the end of the super-cycle already, albeit there could still be one last leg up then crash - possible around 2018. Printing Currency: Regardless of the precise timing – because government will continue to print currency with impunity – and debts rise ever higher, we think the super rich will continue shunting their free currency speculation into prime London (and New York) property where supply is severely constrained and demand will always remain strong because these are global super-cities with all the attractions the rich require: 1) education; 2) shops; 3) schools; 4) restaurants; 5) theatre; 6) healthcare; 7) safety. Little wonder why large 4 bedrooms terrace house in Fulham now cost over £2 million. There are so many multi-millionaires around the world that want a base in London for their families and supply is just not forthcoming for houses. No London houses are being built (only expensive apartments). Inflation: If one looks back on prices in the last 35 years, a one bedroom flat in West London cost £30,000 in 1980, £75,000 in 1990, £140,000 in 2000 and £400,000 in 2015. Its not because there has been massive GDP or business growth, its mainly because of the gigantic currency printing sprees that lead through to property prices in the more select areas. This is not going to change. We would envisage this same one bedroom flat costing £1,000,000 by 2025. All the millionaires and billionaires in the world use this printed currency - or free money - to park in property. At least they have then hedged against inflation by buying bricks and mortar - something where the supply is restricted and demand remains strong.